Earlier this summer, I received an email from a distraught Chicagoan asking if I knew anyone who would save her family’s recently totaled, beloved Jeep from the crusher. I did know someone: me. But the two-month saga I went through to acquire the vehicle nearly broke my soul. That second bit is still accurate, but the first part—an expression of how, at one point, I really had lost all hope—no longer is thanks to a last-ditch effort. Because now the Jeep is in my driveway. Before I start, allow me to personally apologize to my boss, Patrick George, who begged for my next car to not be a Jeep, so that I could stretch my skills as a writer and mechanic. A nice first-generation Mazda RX-7 would be so great, we agreed. Think how many stories I could write as I learned to work on a rotary engine! But here I am, owning another old Jeep. Again. In late July, a mystery person named Tracy sent me an email titled “1991 Jeep Cherokee Laredo in Chicago: Junk or Save?” in which she described how sad she was about the prospect of her recently-totaled family Cherokee getting crushed or mistreated. On June 29, the car got smacked in the driver’s side fender. I’ve spent the last few weeks trying ing to figure out what to do ... I don’t want to total it...Both my mechanic and my Dad think a rebuilt front differential and a new fender would keep the car on the road for a long time to come. I’d like to find a good home for it rather than let insurance junk it. We have all the original and service paperwork. The car has been rigorously maintained for nearly 30 years. I just rebuilt the whole electrical system a few months ago. Here’s the deal: I decided I was willing to let go, and was kind of in mourning about it, and then my friend, your reader, suggested I write to you. This was an email from the heavens. Here was a cheap, single-owner, meticulously maintained manual-transmission 1991 Jeep Cherokee—the exact Jeep I’ve long dreamed of buying—that needed just a new fender and maybe a few other things, and whose place in my garage would make someone other than me really happy. As soon as I read the email, I told Tracy I was interested. But there was no response. Then I sent another email. Still nothing. Then the next week came along, and Tracy finally got back to me, telling me the insurance company had taken the Jeep, and that it was being put up for auction a few days later. A bummer. Seeing that this incredible automotive icon could only be bid on by scrappers, exporters, dismantlers or rebuilders worried me. This thing didn’t belong in the great junkyard in the sky. I made it a mission to save this Jeep no matter what it took. I reached out to a contact at one of my go-to salvage yards in Michigan, and the manager told me he’d bid on the Jeep for me. I told him my max offer was $1,100, he put in the bid, and I waited anxiously. Half an hour after the auction began, I learned that the Jeep sold for $900, and I was over the moon. This was it. After years of searching, I was finally going to own my dream Jeep—a ’91 manual Jeep XJ Laredo! Then I asked my junkyard contact how to pay and when to pick the Jeep up. But no answer. I asked again for confirmation that we did in fact win the bid, but still no answer. After a number of hours, and calls going straight to voicemail, something seemed off. Six hours of anxious anticipation later, finally I got a call from the junkyard. An employee was calling on behalf of the manager to tell me that they hadn’t actually bid on the Jeep. But then I had another thought. I had called up IAA while I was waiting on my junkyard contact to respond to my texts, and I asked about the Jeep. “Did you win the bid?” the representative asked after I told her the vehicle stock number. “Are you Speedway Auto?” She had told me the name of the organization that had won the Jeep. I hung up the phone, and then frantically looked up the company. After finding a scrapping company called Speedway Auto Parts in Joliet, Illinois, I nearly vomited at the idea that this poor, innocent XJ could possibly wind up dismantled. Luckily, after calling them up, I learned that this wasn’t the right Speedway Auto. I called IAA back and learned that I was looking for Speedway Auto LLC, a dealership based out of Lafayette, Indiana. I really do wish you luck....it’s been hard to let go. ...My husband really wants me to let it go! I called up the Indiana used car dealership, and was put in touch with the dealer named Sly (yes, not the most reassuring name for a car dealer), who agreed to sell me the Jeep he’d just bought. The arrangement was for me to drive to Chicago, where the insurance auction had concluded, and just snag the Jeep from there. This way, Speedway wouldn’t have to transport the thing. On Aug. 7, we agreed to a price of $1,700. Apparently, something was up with Speedway’s “guy” in Chicago. He wasn’t able to pick up the Jeep from the auction site, so they sent someone else, who towed the XJ all the way back to Indiana. “I’m not sure the exact price Sly agreed with you...But I do know that the number has gone up,” the text continued, citing the towing cost and “time spent on the vehicle” as reasons for the price hike. On top of that, apparently the Jeep was now in a shop in Indiana, so I could expect repairs to further add to the price. “How much are you willing to pay more?” the text continued. Then the next day, Speedway told me they’ve been getting offers from folks as high as $3,000, and that that’s what they’d sell it to me for. At this point, I was just about ready to let the Jeep go. Maybe it wasn’t meant to be. I had originally planned on getting this Jeep from Tracy for just a couple of bucks. 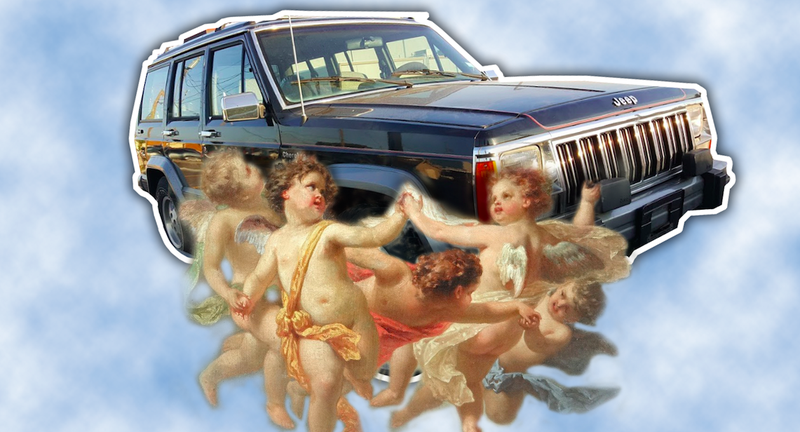 Then, when it went to auction, I figured—since the Jeep had allegedly been so well maintained, and because it was the holy grail—I’d be willing to drop a grand on it. When my junkyard contact let me down, I still hadn’t given up hope. “Maybe I could still get it for cheap?” I thought, naively. But now I was talking to a Buy Here Pay Here dealership five hours away in Indiana, who hasn’t sent me any good pictures, who keeps hiking up the price, and whose communication has been shaky. The Jeep looked okay, but to know if this thing could be made showroom quality, I needed someone to look at it. Luckily, an Indiana Jalopnik reader named John was nice enough to send a scout, who called me up, and told me that the Jeep looked nice, but that maybe it wasn’t worth buying if I wanted something showroom quality. He wasn’t sure. So I messaged John a few times back and forth. “Let it go. Embrace the projects you have,” he told me, after I waffled back and forth. John saw me at a low point: a man clearly addicted to a Jeep, and who just didn’t know when to stop. A few days after, I asked Speedway Auto to send me a few more pictures, and when they sent me a photo of the title (which my junkyard contact said looked fine) and the picture above—which shows a dent-free hood and nice paint—I decided to talk with Sly. He agreed to sell me the Jeep for $2,000. That was a bit high for a totaled XJ, but for my holy grail Jeep, I decided it was worth checking out. Then I caught a lucky break. A Jalopnik reader named Derek, whom I had texted, was surprisingly thrilled to waste his Saturday with me, and so was his friend, Chris. Even better, they volunteered to take one of their trucks after hearing that the XJ I planned to drive down there lacked air conditioning and functional windows. So on Saturday morning—two months after I received that initial email—we piled into Derek’s brand new Nissan Titan HD, and cruised five hours to Lafayette, arriving at the dealership around 3:30 p.m. That’s when we saw the XJ in the lot shown above. It looked decent. The paint almost looked new, all the panels seemed fine except for a small dent on the right front door, some paint rubbed off where the fender hit the hood, and of course the fender itself. There was also something wrong with the hatch. Looking at the photo above, you’ll see the pin-striping not quite lining up on the right side. A close look at the rear hatch hinge showed the roof had been bent a bit. The fender damage also looked pretty nasty, but most importantly, it looked entirely isolated to that one panel. But otherwise, the Jeep looked sweet. The interior was cherry aside from the lean of that driver’s seat, the missing radio, and a small brown stain on the front passenger carpet. After seeing the hatch damage, I tried to bargain, but Speedway was having none of it. The price was $2,000. I asked Derek and Chris what I should do. They weren’t sure. So I walked away. We both concluded that there really was none. I could resell this thing for at least $2,000 as is in Michigan. And if I could repair it, it’d be worth significantly more. But was it nice enough? That roof was damaged. The tailgate didn’t fit quite right. I flipped a coin. I watched as Abraham Lincoln’s head went into and out of sight as the penny flipped through the air for what felt like an eternity. Just before I thought I was about to die of old age, I snatched the penny out of the air, and placed it onto my forearm. Tails: Don’t buy it. But then, before we’d gotten more than about a block from the dealership, I asked “Should I buy it?” Derek stopped the truck, waiting for me to make up my damn mind. “Best out of ten,” I declared. I flipped the penny nine more times. Eight of the 10 flips were tails. I called up Tracy, telling her that I had her XJ in tow, and her elation was palpable. Never have I heard somebody so thrilled and emotionally touched by someone else buying a car. She kept telling me how happy she was that someone who appreciates Jeeps would end up owning her dad’s baby—a vehicle that was near and dear to her family. And it was at that moment that any doubts about buying this Jeep disappeared. “Oh my God you totally made my Dad’s day,” she wrote. “He is just over the moon that the car has been saved. Me too. This is just great.” She then sent the original dealer sticker, further fortifying my decision as a good one. Then he went into the vehicle’s history, telling me about how the paint looks so good because the Jeep had been repainted to factory spec, and about how that issue with the rear hinge came about after he bumped into a tree after forgetting the rear hatch was still open. He also told me that the receiver tube at the front of the Jeep was there because this XJ was actually a test mule for the design of a Warn “removable winch” setup. I can’t tell you how happy the entire family is the fine old car has found a home rather than a crusher. It was our family car, two grandchildren learned to drive a manual transmission on it and it made more than one trip to the vet not to mention many trips to the garden store and the lumber yard. Derek drove into the night like a champ, with the Titan seeming to shrug off the roughly 5,000 pound load in tow without issue. We arrived at my house in Michigan sometime around 3 a.m. It wasn’t really until the next day that I realized the full extent of the damage, which was mostly minor. Tracy’s insurance company estimated that the Jeep required over three grand in repairs, mostly because it needed a new painted fender, a new wheel, a new front bumper, a new fender flare, a new knuckle, and a bunch of other little things. But a lot of that was bunk. The front bumper was fine, and a lot of the other parts they called for could be sourced from a junkyard for a song. Plus, I yanked the fender off and found the inner fender to be untouched. On the downside, it looks like the reason why the inner fender is fine is because the front wheel took must of the brunt. That ended up bending the “C” of the front axle inward to where it’s almost touching the coil spring. So I need to find a new axle, a new bumper end cap, a radio, a fender flare, and I need to have the fender painted. Plus I have to have this salvage-title Jeep inspected so I can drive it legally on the road. It’s not perfect, and I had to go through hell to get it (with the price ballooning from a song to $900 to $1,700 to $2,000), but in the end, I own my dream Jeep—an unmodified, rust-free, manual transmission, 1991 (the first year with the more powerful and reliable Chrysler fuel injection system and the improved cooling system), vent window-equipped Jeep Cherokee Laredo. I need nothing more in this life. Correction: I originally stated that 1991 was the final XJ model year that offered vent windows. This isn’t true. ’92s and ’93s could be had with them, too. And perhaps even later model years could as well, though it’s tough to find later XJs with vent windows. It seems like the take-rate was higher on ’80s and early ’90s models. Sure, I Just Bought a Jeep. But Let The Record State: I've Sold Some, Too.